*sigh* Firefox, it’s like every update I love you a little less. You used to be this technically advanced lightweight browser that showed Microsoft. But ever since Chrome got popular, you’re just running behind whatever the guys at Google are implementing. 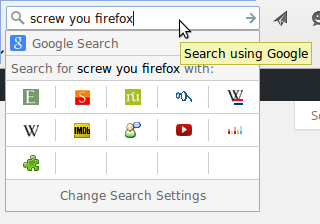 So now Mozilla removed the browser.search.showOneOffButtons option that restored the classic search bar. That “classic” search bar was one of the main reasons why I liked Firefox and this new thing is just a failure. Am I searching through Google, Youtube, Wikipedia? I have no idea, it only displays the hourglass icon. In order to know which search engine is selected, I have to click on it. Then I have to click on the icon of the search engine, which means I need to know which icon is which site, because the name of the site is not displayed (except when I hover it, but that causes an unnecessary delay in my workflow). Though the new search bar is not as bad as Ubuntu’s Unity or Window’s Metro, I can’t understand why software companies simply don’t keep what uses like and improve what they complain about. 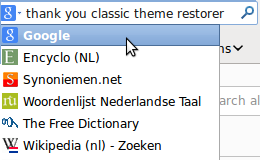 The only way to have the old search bar back is to install the Classic Theme Restorer extension. Yes, you have to install an extension to get basic functionality. You must configure the extension in order for it to work. Go to the preferences (about:addons > “Preferences” button), click “General UI (1)” and check “Old search”. If you want to keep everything else the way was, uncheck all the checkboxes in the all tabs and set “Tabs (1)” to “Curved tabs (Firefox default)”. Now the question is how long this extension will continue to work, because every Firefox update means that some extensions will stop working. And now back to Chrome. This is my problem! You cant see which search engine is selected. New users who never experiences the power of FF simply prefer Chrome. Mozilla is a frickin fool to drive & push its loyal users over to Chrome as well. There are a few things keeping me hangin on to FF & now they are screwing over those too! Thanks Robin for the tip.